Designer Roger Estop was chewing his pencil one day when, ‘eureka!’, he realised that the letters ‘c’, ‘h’, ‘a’, ‘i’ and ‘r’ not only spelt ‘chair’, but could be assembled in three dimensions to form a ‘stable structure with four legs’. The project became a ‘part typographic and part furniture design exercise’, says Estop. 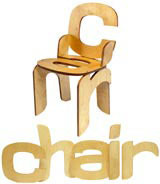 The letters are cut from birch plywood and bolted together to form ‘a practical and comfortable chair’, he claims. By the look of it, there are probably more comfy seats around, but few can claim to spell out their name in wood. Is it just a gimmick or a 21st century design icon? You decide. View the chairs at www.letterchair.co.uk.